A: These days, many women use home pregnancy tests (HPTs) which detect the presence of a hormone called human chorionic gonadotropin (hCG) in their urine. HPTs do not cost a lot, are easy to use and can be done in the privacy of your own home. When a woman has a positive result on a HPT, she should see her health care provider right away. The health care provider can confirm a positive HPT result with a blood test and a pelvic exam. Urine tests can determine pregnancy about 2 weeks after ovulation. More sensitive urine tests can tell if you are pregnant as early as 6 days after you conceive, or one day after you miss a menstrual period. Blood tests are also available. There are two types of blood tests you can get from a health care provider. A quantitative blood test (or the beta hCG test) measures the exact amount of hCG in the blood. This test is accurate as it can pick up very small amounts of hCG. A qualitative hCG blood test gives a simple yes or no answer to whether you are pregnant, This test is more like a urine test in terms of its accuracy. Blood tests can pick up hCG earlier in a pregnancy than urine tests can. Blood tests can tell if you are pregnant about 6 to 8 days after you ovulate (or release an egg from an ovary). A: Yes, you should be able to make that trip during your second trimester. In fact, the second trimester (weeks 14 to 27 of your term) might be the most appropriate time to travel as the morning sickness and other symptoms during your first trimester should be over. You should have higher energy levels which will help reduce any prenatal risks during travel. Do note that it is not advisable to travel after 32 weeks of pregnancy and always remember to seek advice from your obstetrician before making any travel plans. A: What you think is your period is Iikely to be you experiencing bleeding or spotting during your pregnancy. Once you are pregnant, you are unable to get your period because your body starts producing the hormone – human chorionic gonadotropin (hCG). This will interrupt your usual menstrual cycle and put a stop to your periods. If bleeding or spotting occurs, do consult your obstetrician. He or she should check the well-being of the foetus to make sure that your baby is developing well. A: Seafood can be a great source of protein and iron and the omega-3 fatty acids in many fish can help promote your baby’s brain development. However some fish such as King Mackerel and Swordfish contain potentially dangerous levels of mercury which may damage your baby’s developing nervous system, so always eat seafood in moderation and consult your obstetrician with regards to an optimum diet for your baby. A: Your developing baby needs calcium to grow strong bones and teeth, a healthy heart and muscles and to develop normal heart rhythm and blood clotting abilities. If you do not supplement your diet with calcium, your baby will obtain it from your bones, which may result in health problems later on. You should also consider supplementing your diet with a well-balanced maternal milk to ensure you receive the required nutrients during the course of your pregnancy. 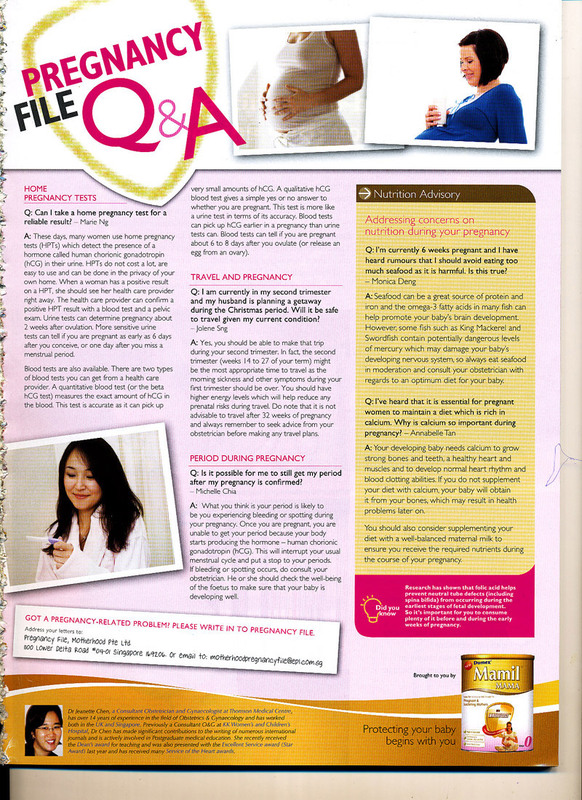 This article appeared in Singapore’s “Motherhood”, November 2009, in their Pregnancy File, Q & A Section.